In 1966, I was 15 years old and living in Ashland, MA. 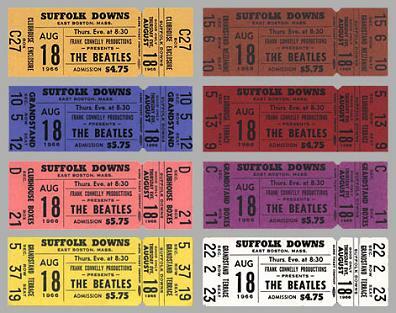 My best friend Steve Wood (“Woody”) had three sisters who were experiencing varying degrees of “Beatle-mania.” It was in early August when their dad came home and proudly announced that he’d managed to secure six tickets to the upcoming Beatles concerts at Suffolk Downs, in East Boston, on the 18th! And, not only would Woody and his sisters be going to the show, but my brother Bob and I were also invited! It was hot and humid on the evening of August 18 when we piled into the Woods’ Plymouth Valiant station wagon. Suffolk Downs, in 1966, was a popular horse racetrack with grandstands and a large centerfield. 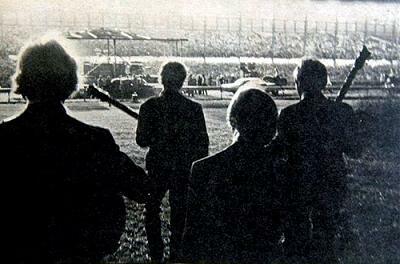 It was on this field that the performers’ stage was hastily constructed, facing the stands (approximately 100 yards away) with the racetrack running in between. We arrived at 7:30 p.m. Also sharing the stage with the Beatles that night were the Ronettes, the Cyrkle, Bobby Hebb and local ravers Barry and the Remains, who opened the show. These guys had ‘em rockin’ in the rafters right from the giddy-up! I was particularly impressed with this group – they more than lived up to their now-legendary reputation as a great live band. They also backed up Hebb for his short but satisfying R&B set. The Cyrkle came on next. Looking like four clean-cut college kids, they played knock-out versions of their two hit songs (“Red Rubber Ball” and “Turn Down Day”), and then proceeded to do note-for-note covers of other hits of the days. They were really good and the crowd responded enthusiastically. After a brief intermission, the Ronettes took the stage. And though I can’t recall who backed them up (it was either the Cyrkle or the Remains), I’ll never forget the sight and sound of those women! Just gorgeous!! Keep in mind that with roughly 100 yards between the performers and the nearest seated audience members, anyone onstage looked about eight inches tall. But even at that distance I could clearly see the skirts slit up to here, the mascara and the beehive hairdos that were the group’s trademarks. Whew! Singing just as sweet, if not sweeter, than they did on their records, they looked and sounded like they were having a ball. That night I developed an affection for their lead singer, Ronnie, that continues unabated to this day. Next up… the Beatles! Wearing matching iridescent green suits (with black velvet collars) they ran onstage to deafening screams and thunderous applause and immediately kicked into the opening chords of Chuck Berry’s “Rock and Roll Music.” Well, the place went absolutely nuts (myself included) and the music momentarily disappeared into the din. Everyone was bouncing out of their seats, singing, screaming, laughing and crying! It was wild! Onstage, the Beatles seemed to be enjoying themselves. And once the roar of the crowd died down, it was obvious they were in top form musically, too. They played terrific versions of “Day Tripper,” “Nowhere Man,” “I Feel Fine,” and I remember a particularly powerful “Paperback Writer.” Watta blast! Throughout the approximately 30-35 minute set, (mostly) young girls tried to run the hundred or so yards from the stands, across the track and infield, to the stage on which the Beatles were performing. Most were intercepted by the hordes of cops and security who were hired for the concert. But halfway through the show a girl appeared behind the row of Vox “SuperBeatle” amplifiers at the back of the stage, and, making a bee-line for George Harrison, she wrapped her arms around him from behind and held onto the startled Beatle for dear life! Meanwhile, John, Paul and Ringo were laughing and cracking jokes (while the audience cheered and hooted) as members of the road crew had to pry this ecstatic fan from poor George. It was a wonderful moment. The show ended at 10:30 p.m. Exhausted but exhilarated, we stumbled out to the parking lot where Woody’s dad was waiting for us. With the sound of six teenagers all talking at once buzzing in his ears, he slipped the Valiant into the flow of traffic for the trip back to Ashland. But the ride home turned out to be almost as memorable as the show. Since most of the other cars on the Mass Pike that night were suburban concert-goers headed home, every toll booth became a rallying point for more displays fo Beatlemania. With horns honking and headlights flashing, kids were hanging out of car windows, waving souvenir pictures of their favorite Beatle. It was pure pandemonium and an amazing display of the incredible energy and thrill of Rock ‘n’ Roll!! It was one night in my life that I’ll never forget to remember.